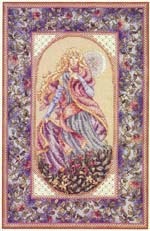 Model stitched on: 29 count natural Glenshee linen from Anne Powell, Ltd.
Model size: 13.25" x 8.5"
Description: She is the personification of a summer's night: subdued, cloaked and mysterious, and the moon lights her way as she strolls through lush greenery. She is surrounded by a dramatic border of deep blues and fanciful foliage accented with beads and specialty stitches. Day is the companion design. Background Information: Night is my attempt to personify (capture in human form) what I feel could be the essence of night... not the threatening aspects, but the calming and soothing ones. Since man is not a nocturnal creature, the darkness holds great mystery, but also the comfort of much-needed rest from the brightness and exhausting activity of day. Stitching Comments: This is smaller design than most of mine, but it is loaded with quarter stitches, and blended floss colors. The specialty stitches are simple ones, and add some variety to the stitching process.